Perhaps the most impressive thing to fall out of the casing are the sensors — lots and lots of sensors. iFixit reports that there are "32 individually numbered sensors on the headset and 24 on each controller". 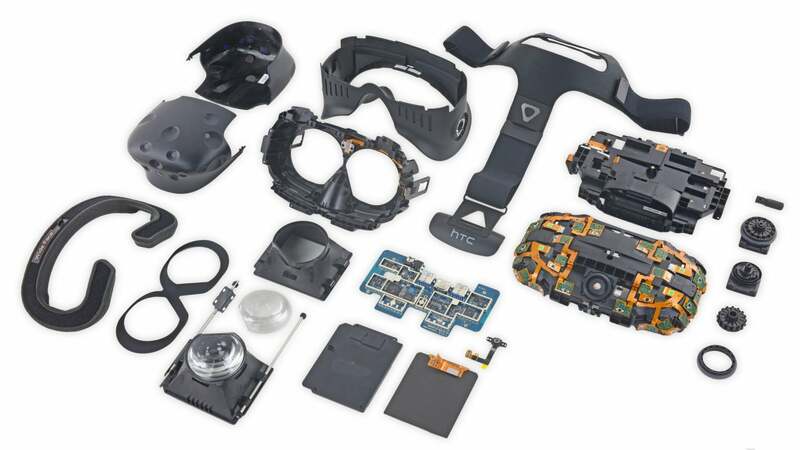 That's a lot of sensing, and no doubt contributes greatly to the Vive's ability to immerse. And, of course, there's no shortage of ribbon cables connecting many of its IR sensors — scattered across the perimeter of the casing — which allow it to detect its place in the world. Elsewhere, the device's displays measure almost 4-inches on the diagonal, yielding a pixel density of 447 ppi. iFixt also discovers that the Vive has a simple contoured lens, unlike the Rift which uses a series of hybrid lenses. That means there's an intricate system of four cogs, which the headset requires to move the lens toward and away from the eye to control focus.